Brothers of Borromeo- Fr. 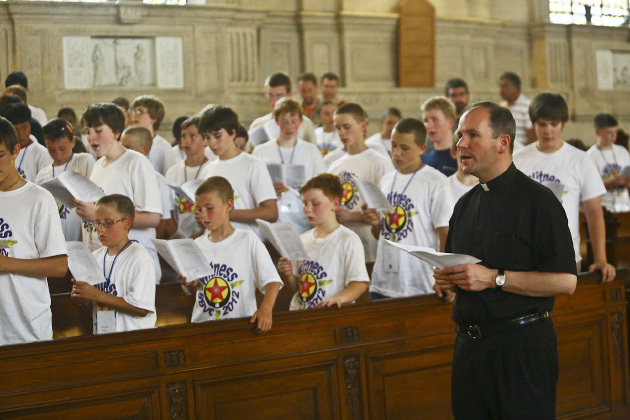 Kevin Gallagher, director of the Vocation Office for Diocesan Priesthood, leads the boys in prayer in St. Martin Chapel. 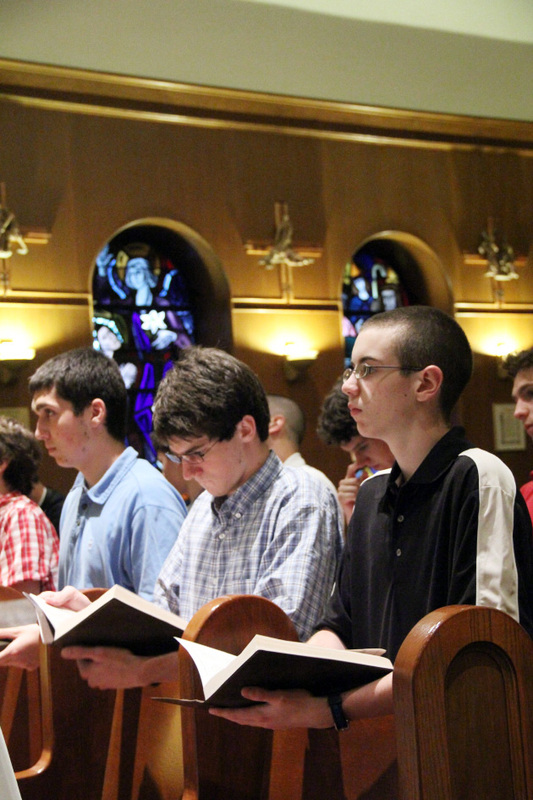 Brothers of Borromeo- Boys who attended the conference praying St. Martin Chapel. 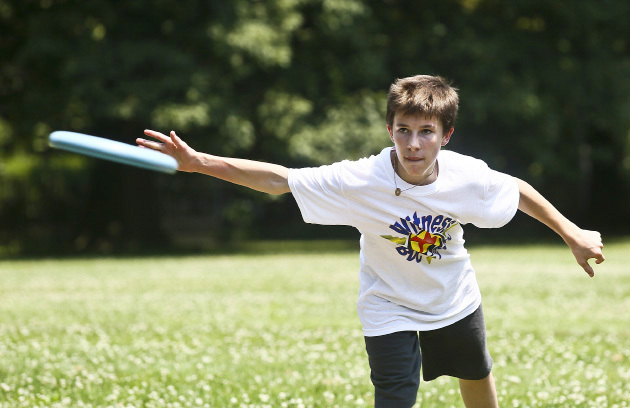 Brothers of Borromeo- Andrew Pezdirtz an 8th grader from Malvern Prep enjoys a game of frisbee on the front lawn of the seminary. 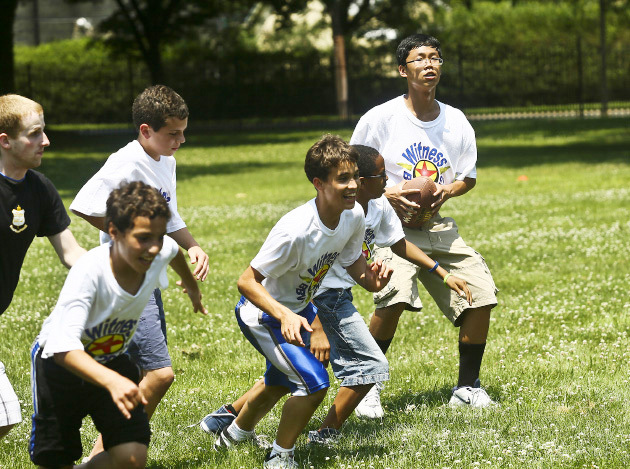 Brothers of Borromeo- Part of the day included activities on the front lawn of the seminary. 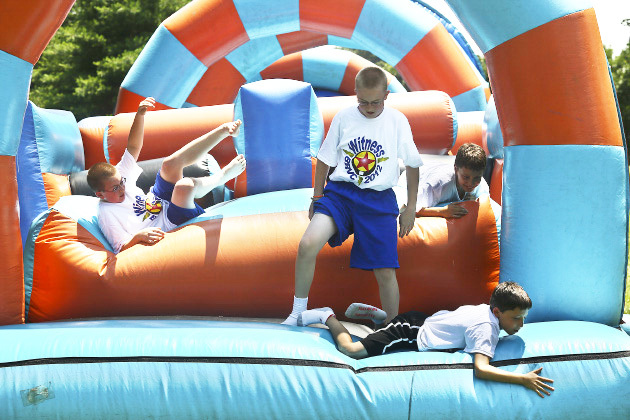 Brothers of Borromeo- Several boys finish the inflatable obstacle course all wearing their Witness BBVC 2012 tee shirts. 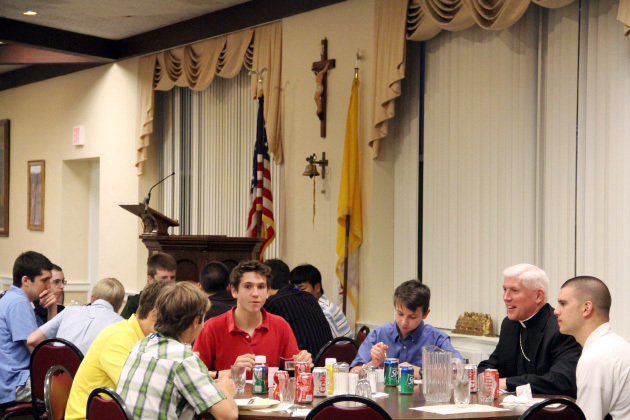 Quo Vadis- Bishop Daniel Thomas enjoys dinner with several young men on Saturday evening which was the third day of their retreat. Quo Vadis- Andrew Parrish (Our Lady of the Sacred Heart in Hilltown) and Kieran Damitz (St Thomas in Allentwon) pray during Saturday evenings Holy Hour. 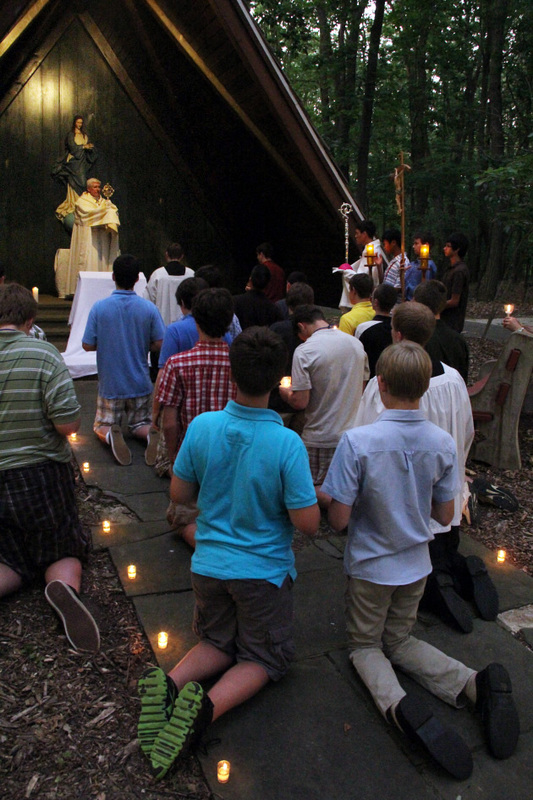 Quo Vadis- Young men from across the arcdiocese and neighboring diocese praying during their four day retreat. Quo Vadis-Parker Eidle (St Ignatius in Reading) prays before the blessed sacrament. Quo Vadis- After holy hour there was a eucharist procession to the grotto where the Woodland Chaple of Our Lady is for benediction. 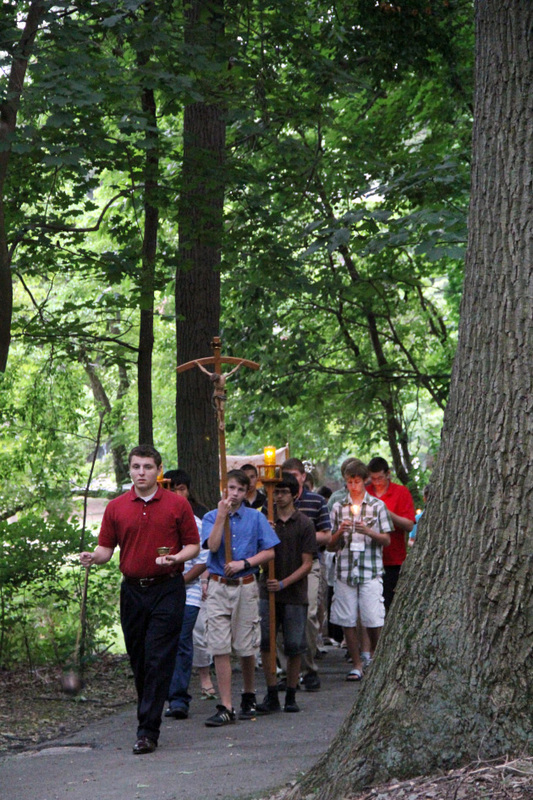 Quo Vadis- Young men from the retreat processed through the woods for prayer in the grotto. 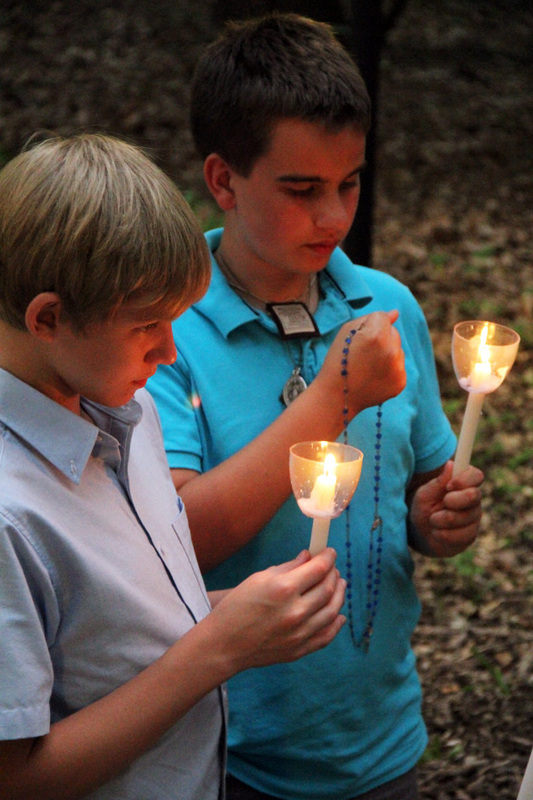 Quo Vadis- Robert Shuster (St Isidore in Quakertown) and Luke Majewski (St Mary of the Lakes in Medford NJ) attend candlelit prayer in the grotto Saturday evening. 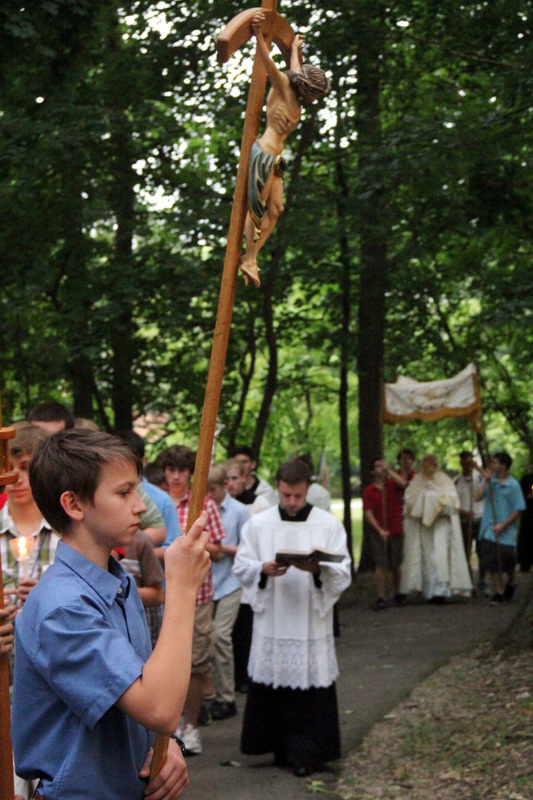 Quo Vadis- Bishop Daniel Thomas leds outside benediction at the Woodland Chaple of Our Lady. 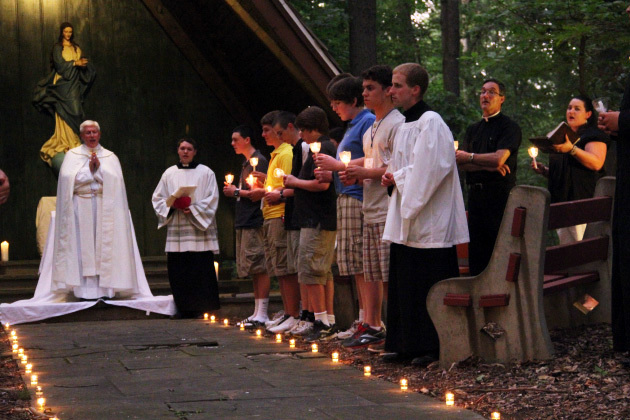 Quo Vadis- Outdoor candlelit prayer was led by Bishop Daniel Thomas on the third night of the retreat. 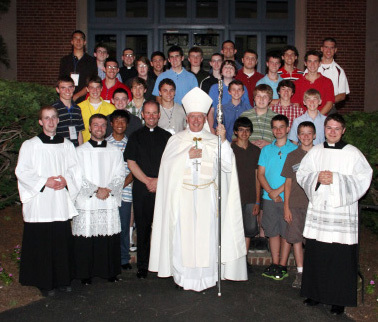 Quo Vadis- The young men of the retreat pose for a photo with Bishop Daniel Thomas.